FLASH BACK: President David Granger presenting Attorney General, Mr. 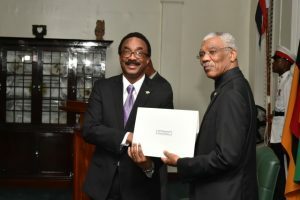 Basil Williams with his Commission of Appointment as Senior Counsel at State House on January 4, 2017. Attorney General and Minster of Legal Affairs, Basil Williams, has been provided with a slew of eminent legal minds to serve as ministerial advisors. The announcement was made by Minister of State, Joseph Harmon, during a post Cabinet press briefing today (May 4, 2017) at the Ministry of the Presidency. The Council, according to Harmon, comprises eminent legal minds in the person of former Caribbean Court of Justice judge Duke Pollard, former High Court Judge, Justice James Patterson and former Justice of Appeal Claudette Singh who is currently the Guyana Police Force’s Legal Advisor. Professors Harold Lutchman along with Harold James of the University of Guyana have also been appointed to serve on the Council. Lutchman and Patterson were recently chairmen of two Commissions of Inquiry- one into the public service and the other into a deadly prison unrest. Former Attorney General and Minister of Legal Affairs, Anil Nandlall has often criticised Williams’ performance.